wenty volunteers from various Living Spaces stores and their corporate office unloaded a delivery of over 200 mattresses for the veterans that AMVETS serves. 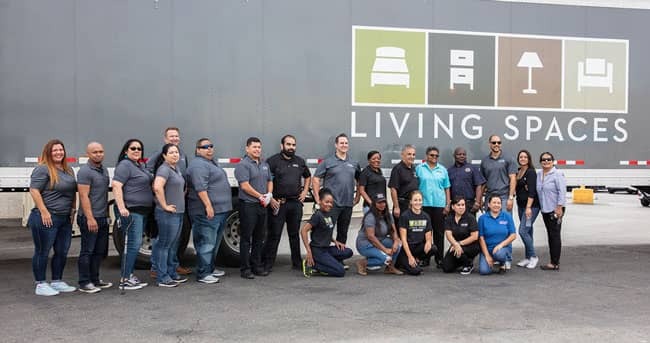 Living Spaces recently announced that they donated mattresses in partnership with AMVETS National Service Foundation as part of its Welcome Home program in an effort to aid veterans. Twenty volunteers from various Living Spaces stores and their corporate office unloaded a delivery of over 200 mattresses for the veterans that AMVETS serves. This event took place at the Team Amvets Thrift Store in Long Beach, CA. The mattresses were designated for delivery to various cities all across California such as San Diego County, Orange County, Long Beach, the Greater Los Angeles County and Fresno. This donation ensures that quality mattresses will be delivered to veterans to improve their health by giving them better sleep. Through the Welcome Home Program, AMVETS gathers and donates beds, pillows, bedsheets, nightstands, dressers, couches, coffee tables, dining room tables and chairs, refrigerators, pots and pans and special request items such as towels and rugs. AMVETS estimates that they do about 60 veteran deliveries per month. For the program to date, they’ve done over 4,000 deliveries. “Many people are fighting battles that we know nothing about. And these are true heroes who served our country. Now they’re home and they’re in need. So to be able to give them a good night’s sleep is something little, it seems. But for them, it might be more than we even know,” says Julian Ervin, Living Spaces General Manager. More information on Living Spaces Community Service support initiatives can be found at www.livingspaces.com/company/giving. About Living Spaces: Living Spaces is a furniture and mattress retailer offering thoughtful designs at affordable prices. For more information about Living Spaces, visit them at any one of their showrooms in California, Arizona, Nevada and Texas or online at livingspaces.com. About AMVETS National Service Foundation: AMVETS National Service Foundation provides support to veterans through service programs as well as providing community and youth-oriented programs designed to promote unity and patriotism. AMVETS National Service Foundation is continuing its commitment to freedom made by our veterans, past, and present.